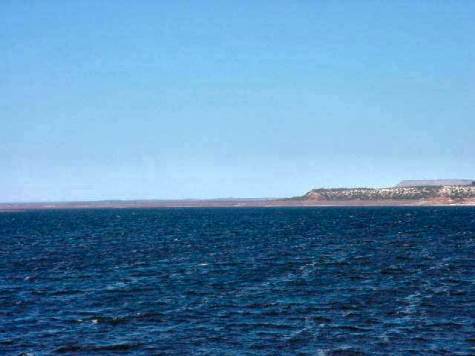 There are several places to bird in Coke County: Oak Creek Reservoir, Fort Chadbourne, and E.V. Spence Reservoir (pictured above) and surrounding areas such as Sanco Loop Road (CR 208) and the rest stop along Hwy. 158. If you want to try for Black-capped Vireo, get to the rest area along Highway 158 at dawn or at sunrise in the spring or summer. 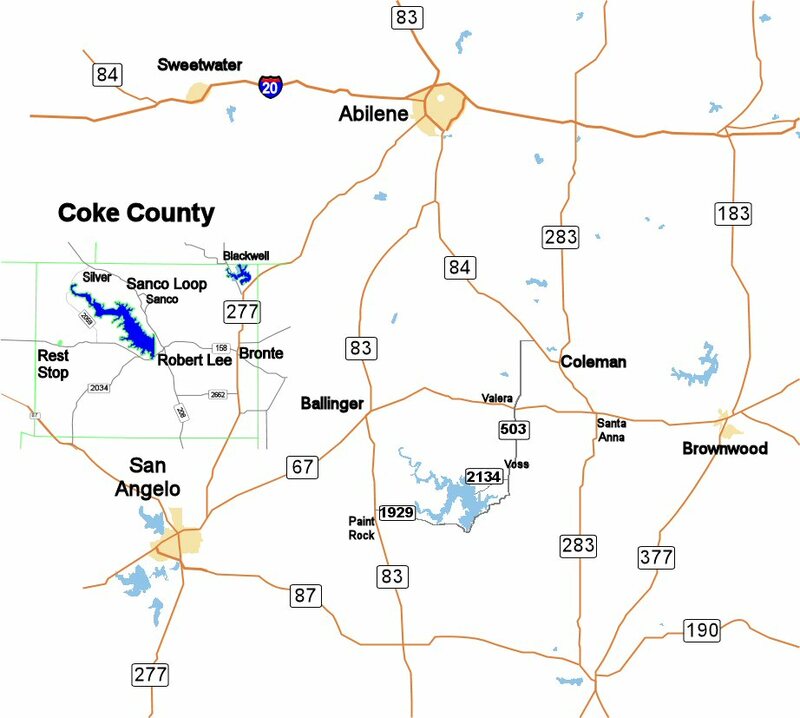 The rest area is located between Robert Lee and Sterling City. Bird both sides of the highway and bring your scope. To the north of the rest area is a great birding spot. This area has produced Bushtit, Scott’s Oriole, Rufous-crowned Sparrow, Painted Bunting, Prryhuloxia, Scrub Jay, Canyon Towhee, Bullock’s Oriole, Red-tailed Hawk, Cassin’s Sparrow, Blue Grosbeak, Verdin, and Black-throated Sparrow. Site 14 along the Panhandle Plains Wildlife Trail is worth the stop. It’s called Dripping Springs Grotto. 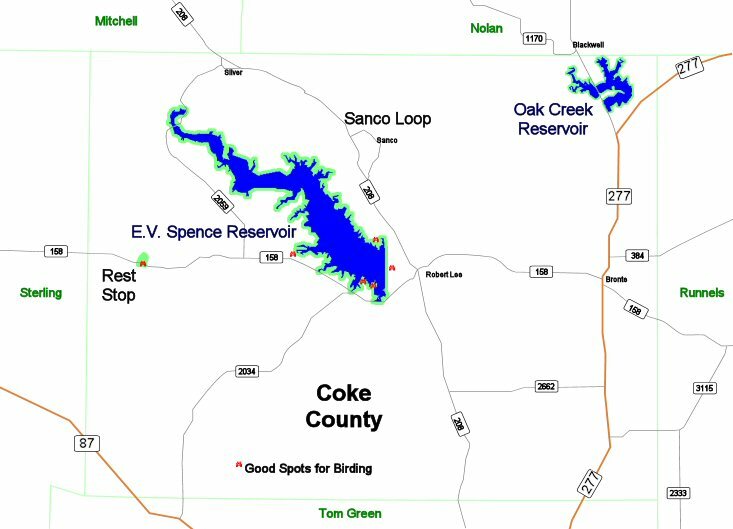 Lake Spence has several places to bird and each has signage indicating the name of the area: Paint Creek Area, Wildcat Park, Southside Park, and Robert Lee Dam South End. Stop at each (small usage fee required) and check out the birds. In summer expect Lark Sparrows, Scissor-tailed Flycatchers, Western Kingbirds, Ash-throated Flycatchers, Yellow-billed Cuckoos, Red-winged Blackbirds, Verdin, Least Terns (they breed at the lake), Common Moorhen, Field Sparrows, Black Vultures, Turkey Vultures, Loggerhead Shrike, and Red-tailed Hawk. Wintering species include ducks, gulls, and Western and Clark’s Grebes. On the north side of Lake Spence is CR 208 and the Sanco Loop road. This is a great birding spot. The road is public but the land is not. You’ll cross several pastures with cattle guards. Bird from the vehicle. Vermilion Flycatcher, Black-throated Sparrow, and other aforementioned birds can be found on this loop. There is a windmill with dripping water which attracts the birds year ’round. Take a look at the pictures of Spence Reservoir for more information.